In June 2018, fans cheered their favorite men's soccer teams during the month-long World Cup in Moscow, Russia; 32 teams qualified for competing spots. The inaugural tournament was in 1930; subsequent competitions have occurred every four years (except in 1942 and 1946 because of WWII). The Fédération Internationale de Football Association (FIFA)—plagued by corruption scandals that began in 2015—is the governing body. Although the United States has competed in a number of World Cup finals, the team has never won the international competition; Brazil has won five times and is "the only team to have played in every tournament," according to Wikipedia. World Cup viewing reached a peak in 2010 as the United States and England faced off; England won the match. An early World Cup US loss to Germany in 2014 and federal racketeering charges against FIFA officials in 2015 resulted in waning interest in US World Cup viewing. (The US team did not qualify for tournament play in 2018.) Almost 17.8 million US adults watched the 2010 World Cup, in comparison with 12.7 million who watched the 2014 tournament. 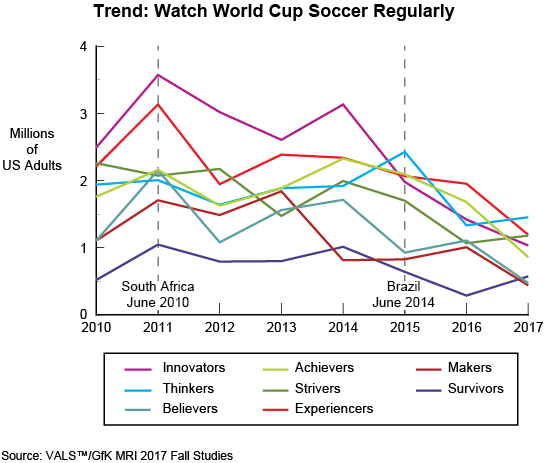 Between 2010 and 2017, a decline in World Cup viewing is evident for all VALS consumer groups except Survivors, who are heavy TV viewers overall. Showing the steepest declines in World Cup viewing are Experiencers, Innovators, and Strivers—the three groups (in rank order) more likely than average to have played soccer in the past 12 months. Experiencers and Innovators often prefer individual-sport to team-sport participation because enjoyment of an individual activity requires no reliance on a group. Experiencers are attracted to soccer in part because of its high energy; Innovators are attracted because of the game's personally challenging aspects of play. Strivers enjoy team sports because participation on a team confers acceptance into a group. Although the groups may play for different reasons, all three groups enjoy some rough-and-tumble masculine camaraderie and a chance to relive highlights with a postgame beer. In summary, not only is watching the World Cup in decline but also watching Major League Soccer is in decline—from 5 million regular viewers in fall 2010 to 4.1 million regular viewers in fall 2017. The data clearly indicate that soccer is not garnering the national attention in the United States that it does in other parts of the globe where few (or fewer) national sports teams exist.